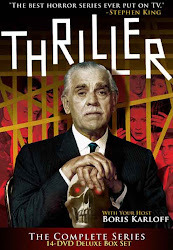 Starring Everett Sloane, Frank Silvera, John Marley. Three boys from the slum grow up to be three disparate men: Cesare Romano (Silvera) morphs into Charlie Roman, syndicate boss; his brother Tony (Marley) a respected doctor; and Lou Adams (Sloane) becomes Charlie’s consigliere. In 1960, Roman decides he wants to go legit and dump all ties to drug trafficking, which raises the blood pressure of some of the other mob men , in particular, Charlie’s nemesis, Harry Gans (Jay C. Flippen). Gans has no intention of losing out on the millions that narcotics brings into the syndicate and he stages a coup. PE: Where to start? How about that it’s nice not to have to look up new words for “claptrap” in my thesaurus. (Don't be alarmed, he doesn't really have a thesaurus. 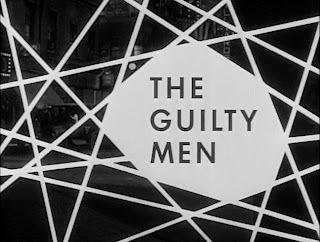 -JS) "The Guilty Men" is heavy on dialogue, light on action, a little too preachy at times, it goes on approximately 30 seconds too long but, by God, this is a good show. Am I just floating on a cloud because the first five shows were so forgettable? (Yes. -JS) Maybe, but I found this episode to be an enthralling prologue to The Godfather (Marley, of course, appeared in The Godfather as Jack Woltz, the movie producer who wakes up to unexpected company in bed) enriched by the solid performances of the three lead actors, Silvera in particular. In his final confrontation with Gans, the actor literally shakes and writhes with anger. JS: Interestingly enough, Peter overlooks the fine performance of Everett Sloane, who was amazing as the downright evil boss in Rod Serling's Kraft Theater production of Patterns five years prior to his stint on Thriller (reprising the role in the film version the following year). (Actually, Scooter, I did mention him in my above paragraph. -PE) It was nice to see him portray a more layered character, although even I will admit when confronted by his wife about his syndicate ties, the scene doesn't entirely ring true. Imagine Michael and Kay Corleone having their post baptismal discussion and Michael answering, "Yes, Kay, it's all true. I've been a very bad man." Not to rain on Peter's parade, but I also think the accents leave something to be desired, both in the prologue and for the adult Charlie Roman (Silvera). (When I get together with my Italian buddies, I speak-a just-a lik-a Charlie Roman. -PE) And the minute his adult brother Tony speaks, it's hard not to be transported to Woltz Studios. Actor Marley's voice and speech patterns are so familiar, anyone familiar with it cannot help but be reminded of The Godfather. But don't be dissuaded by these very minor issues - this is by far the most enjoyable episode we've watched to date. And just when you get to the point of saying, "yeah, this is a good show, but what makes it a Thriller..." it takes a turn to the dark side. JS: And to think, after this, we get the first Halloween episode - as horror comes to Thriller with "The Purple Room"
THREE full Karloffs for this one!??! I think you're jumping the gun; you may have to revise and expand your rating scale to accomodate a number of the great horror shows, which are TONS better than this one! But now that I've-a got-a that-a off-a my-a chest-a, I will-a give-a my-a opinions of-a dis-a episode(-a). I'm still sitting at my TV waiting for the final wrap-up (or "denoument" as they say in artsy circles). So what happens to Gans? Does he get away with murdering all of his competition? Actually, I didn't find the episode too long...I found it fairly engrossing. But I NEVER expected it to just stop cold with Everett Sloane being gunned down and J.C. Flippen grabbing the incriminating evidence and fleeing. Was that off-screen car-crash at the end supposed to tell us that justice triumphed? Maybe they should have pared down the lengthy prologue so that we could have had a decisive conclusion to the drama. The young-a men-a in the prologue were very-a convincing, and it's good to see some of Thriller's dark, brooding atmosphere start to appear. Frank Silvera is, as always, very entertaining (check him out as the malevolent gravedigger in Hitchcock's classic Bradbury TV adaptation "The Lifework of Juan Diaz" from 10/64). * Sloane, Marley, Flippen were all at their flamboyant best (also Anthony Carbone as Johnny Longo)....but I fear that the scenery in this show endured a tad too much chewin' from these gentlemen. Still, it's fun...if somewhat overblown. Director Jules Bricken, whose work was good in this episode, will hit it out of the park later in the season with "The Devil's Ticket". I think his brilliance as a director was clearly on display in "The Guilty Men"'s bizarre, intense, but very insightful funeral home scene. It bears repeated viewings. * Incidentally, Frank Silvera, a very talented and savvy actor, died tragically at his home in 1970. In 1988 I had a long talk with actor Royal Dano, who told me of his friendship with Silvera and his warning to him: "Frank...DON"T mess with that electric garbage disposal yourself; call a professional repairman!" But Frank didn't listen; he died of electrocution in his own kitchen messin' with that damned sink disposal (true story). I'm-a gonna notta take-a umbrage-a with-a yer comments in re: Italian accents. I took the whole screech of the tires at story's end to mean that the producers had shot their budget with the "meeting of the capos" scene. There must have been at least 20 Italian guys in that scene. No way they came from Los Angeles. They got flown in. So the elaborate crash/mutilated bodies scene got axed. I certainly want to avoid a Card Sharks approach to rating the episodes. Is it higher than a "Mark of the Hand"? Is it lower than "The Purple Room"? My "humorous" way of saying that the overkill of the accents/dialects was almost laughable; Jules Bricken takes the blame on this one. Lower than "Purple Room"? Yes! BUT....prepare now for "Thriller's" first classic episode! I was slogging through the first 5 episodes trying to catch up to you guys when I decided to skip ahead and view "The Guilty Men". Frankly the first shows are so disappointing that I am having trouble watching one after another and I have to take a break. Maybe one a day? Otherwise, if I didn't already know some great episodes were eventually coming up, I might give up. "Thriller" does not look like a thriller based on early returns. I've heard they decided to fire producer Fletcher Markle and hired William Frye to take over as the new producer starting with "The Purple Room". Yes, "The Guilty Men" is the best of the first 6 shows, but I don't see it being worth 3 Karloffs. Kind of hard to believe Everett Sloane would become Mr nice guy. Speaking of strange deaths I believe he committed suicide in real life, didn't he? I guess the excellent acting by some of the great character actors influenced your voting. Barf. Thriller tries to be Playhouse 90 and winds up with what seems like hours of guys yelling at each other. I don't care if they're master thespians; I don't care if much misguided love is ported over from their other performances. I just want it to be over... at which point I check the elapsed time, and I'm only 20 minutes into this interminable mess. "The Watcher" is a masterpiece next to this. 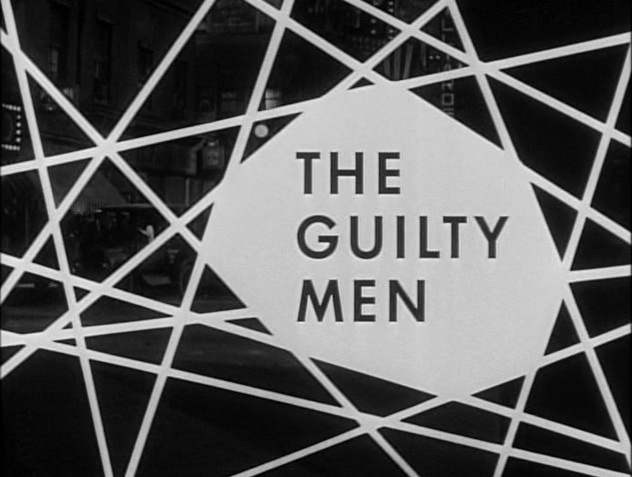 "The Guilty Men" rates maybe a single Karloff pore. Not even a portion of his head. PS: John: It's "trouper," as in "my wife is a trouper," which means she'll take one for the troupe, not "trooper," as in soldier. Troopers do what they're told. Troupers volunteer. Pretty good episode, but still nothing to remember fondly 50 years later. It seems like Everett Sloane never aged--watch The Lady From Shanghai and then The Guilty Men and see what I mean. This is one of those episodes where it fails as a thriller but would have been a knock-out on half a dozen other anthologies. 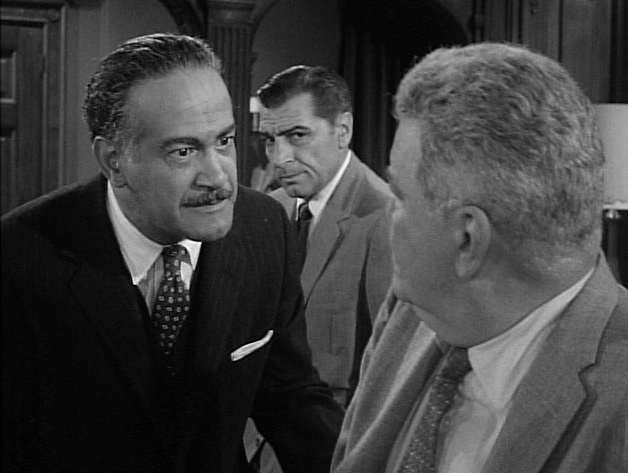 What a powderkeg cast of veterans -- Everett Sloane, Jay Flippen, John Marley, Frank Silvera and Anthony Caruso... Nice foreshadowing at the start, ala Public Enemy, and while the old school actors are doing a lot of shouting at times, it never feels too-over the top. It's all too predictable down the line with only Eliot Ness missing. I love Flippen's line -- "Just because your Mr. Louis Adams with a social register wife, don't think I couldn't stink you up good, all the way down the main line!" This was a straight up organized crime story that would make a better episode of "The Untouchables" than what I think of a "Thriller". Still, for the first time we see two motifs which would be used again to better effect in later episodes - the opening scene of a deserted city street, the slience being broken by the sound of footsteps before we see the person making them - see the first act of "Yours Truly, Jack the Ripper" for a great use of this. Second, this is the first episode to end with the dutiful wife bid goodbye to her husband who then promptly meets a gruesome fate. See "The Cheaters" or "The Devil's Ticket" for better examples. In fact, this episode should have ended with a reaction shot of Sloan's wife seeing his body lying on their doorstep while we hear the car crash off screen, then panning down to the body as the famous Thriller lines appear. It would have better underscored the "dying by violence" theme from the beginning of the show. Another flat entry in the THRILLER series. Certainly the acting is above par, but I was still reaching for the NO-DOZ halfway through. The storyline of the mob boss wanting out of narcotics made me wonder if Mario Puzo saw this before he wrote THE GODFATHER. John Marley gives a solid performance as always. As a side note, has anyone seen Marley in the 80's horror gem DEATHDREAM?. 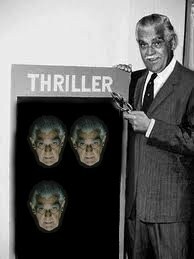 "1 Karloff" for decent performances by Sloane, Flippen, and Marley. I thought The Guilty Men was mildly entertaining, but I kept hoping for some sort bizarre twist to happen. I was impressed with the opening scene where are three main players are kids. It was acted and directed well. After that it was a straight mob story. As many others have pointed out, there were many times when I felt that I was watching a precursor of The Godfather. Brando's Don Corleone reminds me an awful lot of Frank Silvera's performance in this episode. I wonder if Marlon ever watched this. I took all of the exaggerated Italionisms with a dash of olive oil. I have a lot of Italian friends and I'm sure that they'd get a kick out of the acting in this episode. One plot point that really surprised was the blunt manner in which the burgeoning heroin market was dealt with. I would think that the studios back then would only allow for the mention of 'drugs', but not the H word. It's impressive that the a very real world issue, such as the dilmmea of getting into the new drug racket, was able to be dealt with in a very realistic manner. I wonder if soon to be Attorney General Robert Kennedy watched this episode and if it helped drive him to go after the mob. One plot point that I guessed wrong was whether or not Lou's loyalty would remain with his childhood friend Charlie or switch to Gans. For awhile I sensed that Lou and Gans would murder Mr. Roman. My verdict on The Guilty Men is 2 Karloffs. It's already in the 30s here in Atlanta, but I had to open the windows to air out the house after this stinker. I've defended a lot of performances in the first few episodes, but I've got to say, aside from Jay C. Flippen, who's great fun as a villain and snarls out the dialogue without getting the cheese caught in his teeth, I thought the acting was some of the worst I'd ever seen. Everett Sloan was so flat I couldn't believe this was the guy who delivered that great monologue in "Citizen Kane." During John Marley's big speech at the funeral, I kept checking the walls behind him for bite marks. And the lady playing Frank Silvera's wife should have had her union card re-possessed after this one. Add a lackluster plot that tells more than it shows and a big dramatic scene cribbed from "The Little Foxes" (what Flippen could have done with a line like "I'm lucky. I've always been lucky. I'll be lucky again.") and you've got a good reason to stop watching. Thanks for reassuming us that the next episode is some real horror. Yeah, I'm late to the party (although I was following along when this serial blog debuted.) Like "Rose's Last Summer" (with Mary Astor), it's fun to see these veteran actors at work, but overall it's slightly flat drama. It also bothered me in the flashback prologue that one of the young actors calls a character "CHEZZ-a-ray" (the pronunciation in use through the rest of the episode) and another says "chezz-AH-ray." Wasn't Bricken listening? i give this a 2/4. The Italian stereotype is glaringly stupid. I agree with the reviews, i.e heroin, mob, godfather. But really, J.C. Flippen? In the 1962-1963 season, Flippen was cast as Chief Petty Officer Homer Nelson on the NBC sitcom Ensign O'Toole (Disney icon Jones). The Irish mafia? Yup--ME TV has it on again tonight - "The Italian stereotype is glaringly stupid." You betcha-Flippen ain't no Paisano, capece!. I don't know if you mean that Jay C. Flippen is unconvincing as an Italian or as a villainous character. But for me when it comes to the second thing, it's just the opposite situation with him, because the first thing he makes me think of is CAT BALLOU, where he plays the conniving sheriff (you never see HIM harm anyone, but he's constantly "in bed" with the bad characters). So even though CAT BALLOU is a comedy, it's easy for me to buy him as a villain.